Iowa-born and Montreal-based Laurel Sprengelmeyer, alias Little Scream, has a knack for surrounding herself with wide-ranging musicians off of whom she can bounce her various musical inspirations. Combining influences that range from bluesy rock to the easy breeze of the Beach Boys, Little Scream performed with the assurance of a veteran rockstar and the earnestness of a kid testing out new material at an open mic night. Accompanied by a bass player, drummer and keyboardist, Sprengelmeyer kicked off the set with a quick "You look good, here we go!" before launching into a set that would include material from her 2011 debut The Golden Record and new material from her soon-to-be-released sophomore album, Dance In A Void. While the live set doesn't exactly capture the musicality found on her recorded outputs, it was a solid performance marred only by a thinning and chatty crowd. She skilfully played the guitar while putting her impressive pipes on display, and her backing band accompanied her more than adequately. Some of the live arrangements veered too much into Journey territory, and the addition of a metal afuche-cabasa was largely unnecessary, although Sprengelmeyer assured us that the cabasa is "everything right now." 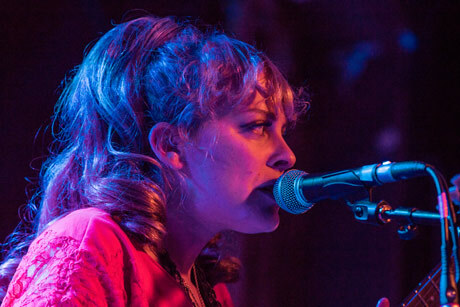 She thanked the other bands on the bill, and also "Pop Montreal," seemingly forgetting which festival she was playing, and performed one last song before bidding adieu.